The Oregon Coast History Center is just that, a center for learning about the history of not only the development of Newport, but Native American traditions and cultures as well. Loretta Harrison, executive director of the center, says there are two buildings to see when you visit, the Burrows House Museum and the Log Cabin Museum. “A lot of people see one or the other, because they end up not making it to the other site,” Harrison said. The funny part is the two sites are within the same block, one at the end of the block and the other in the middle – tucked off Highway 101, so traffic isn’t an issue. From quilts to antique pianos to parts and pieces of shipwrecks, the museum includes exhibits from the past that give visitors a real sense of the history of the area. One exhibit that Harrison said would stay awhile is about shipwrecks. From old schooners to more modern wrecks, namely the New Carissa, there is an entire hall filled with artifacts and mementos. “People are just fascinated with it, so we have left it up,” she said. Harrison said that both the Log Cabin and Burrows House have gift shops where proceeds go to keep the doors open, and both have a strong selection of local history books and maps. Both sites see anywhere between 8,000 and 10,000 people annually, and Harrison said to check the society’s web site to get hours of operation, as they change seasonally. 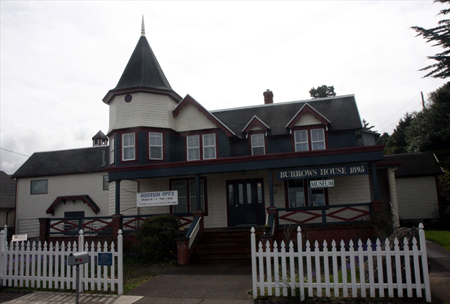 About the Oregon Coast History Center: History is always changing . . . and so are the exhibits and programs offered by the Lincoln County Historical Society. Visit two museums at one site and explore many different exhibits. Check out the museum stores with books and gifts that offer a closer connection to the fascinating history of this coastal region. Delve deeper into the past in the research library. What to bring: Curiosity. With the different focuses of each building, and artifacts ranging from historic office equipment, to quilts, to fishery and industry history, chances are you will find something to pique your interest. Give yourself several hours and make sure to visit on a day when both buildings are open. Tip: Harrison couldn’t say it enough: There are two buildings to see when you visit. So many people will spend time in the Queen Anne Victorian Burrows House that they will forget the Log Cabin and vise versa. In addition, the Lincoln County Historical Society is trying to set up a maritime museum near Newport’s historic bay front. If you are so inclined, ask how you can help make finishing the site a reality. Season: The center is closed for two weeks in December; otherwise it is open year-round. Getting there: Plug 545 SW Ninth Street, Newport, Oregon into the GPS, and it is pretty easy to find. The center is one block off Highway 101 to the east, behind Pig ‘n’ Pancake. Coming from the north, if you pass over the Yaquina Bay Bridge, you have gone too far south. Contact information: You can reach the center to find out the latest hours at 541-265-7509.